Lately reading the news from around the world has felt like swimming in a wave pool. Every time you get over a wave and find your footing, another one comes and knocks you off your feet. It’s hard to rejoice in anything positive. Having fun seems like a betrayal. Attempting to create art feels like a futile exercise. Constantly feeling like, what is the point? And yet, even with the barrage of bad news, there is so much to feel inspired about. This summer I visited my family in America; Dearborn, Michigan and New Jersey specifically. I have nieces and cousins who wear hijab ranging in age from 9-24. What struck me is how confident they are in their hijab. They don’t just put a scarf on their heads. They go to their elementary schools, high schools and colleges and rock their hijab. It is who they are. I admit I find myself wondering a lot about how they do it. How did they get so confident? I started wearing hijab when I was 18 and I was anything but confident. Even now, I am still figuring out how to put my outfits together with hijabs to match. But these girls make it seem so effortless. And yes, I have asked them and they just shrug it off… “I don’t know.” It’s something they can’t seem to articulate, probably because they haven’t really thought about it. It is absolutely second nature to them. And I envy them; but I’m also so happy for them. I am happy that they are finding themselves represented more and more in the media in ways I never did when I was younger. Muslimah Media Watch, for instance, is a prime example. There are blogs, Youtubers and Instagram stars appealing to Muslim women. There are also books with Muslim characters and some with actual hijabis on the cover! Have you all seen the ad for Rhianna’s Fenty Beauty? No? Click here. It’s glorious. Finally, an ad that had women of different complexions! An a makeup line offering more diverse makeup shades. The line just hit the market so we’ll have to see the reviews on whether or not the line delivers on its promise. But until then, I will forever remember the way I felt watching hijabi Black model Halima Aden appear on screen. I wanted to cry when I saw it. For the first time, this felt like real representation as a Muslim woman. She’s just a beautiful Black woman walking down the street, laughing with friends, who happens to wear a hijab. She isn’t being saved. She isn’t “breaking barriers.” She isn’t the “first hijabi to…” She is just being who she is. I am here for it. It’s exciting. Seeing her reminded me of watching my niece audition for HijabFest, a modest fashion show and bazar in New Jersey. I sat there while 30 hopefuls, aged 5-35, walked the mock runway. This diverse group of women were wearing their hijab in every way possible. I wish I thought to take pictures because these girls were slaying their walks! They were confident fashionistas living a dream. Much like Ayana Ife on Project Runway this season. While not the show’s first hijabi, what makes me love her is that her design aesthetic is modest clothes, which Ife defines as “not showing any skin.” Whatever the challenge, she puts a modest spin on it and shows that being modest and fashionable are not mutually exclusive concepts, something that MMW has explored in the past (here, here and here). I’m intrigued to see how it all plays out in the show. So far, at the time of this writing, the judges have been impressed with her skills and designs. She’s a joy to watch too. She’s funny and sweet and her smile makes me want to smile. During episode 4, she schooled Heidi Klum about how hijabi women dress outdoors versus indoors for a sleepwear challenge, and that two-minute conversation was better dawah than any lecture I’ve seen. It was just a normal conversation between two women, one who happens to be an Über-famous supermodel mogul and the other one who wears hijab. And speaking of modest fashion, this year Anniesa Hasibuan became the first Muslim Indonesian designer to bring her designs (including hijabs!) to New York Fashion Week. She also focused on featuring only immigrant models during her show. When I see those pictures and videos, I think of my nieces and cousins who might not buy from the collections because, like most designer clothes, they aren’t affordable to the masses, but they can use them as inspiration to create their own masterpieces. And it seems like other fashion houses are taking notice. In The great cover up: why ​we’re all dressing modestly, designers talk about how the trends are moving to modest fashions and how Muslim women are driving that trend. But here we have designers making clothes that fit the Islamic aesthetic instead of co-opting the actual clothes like Dolce & Gabbana did with their abaya line. 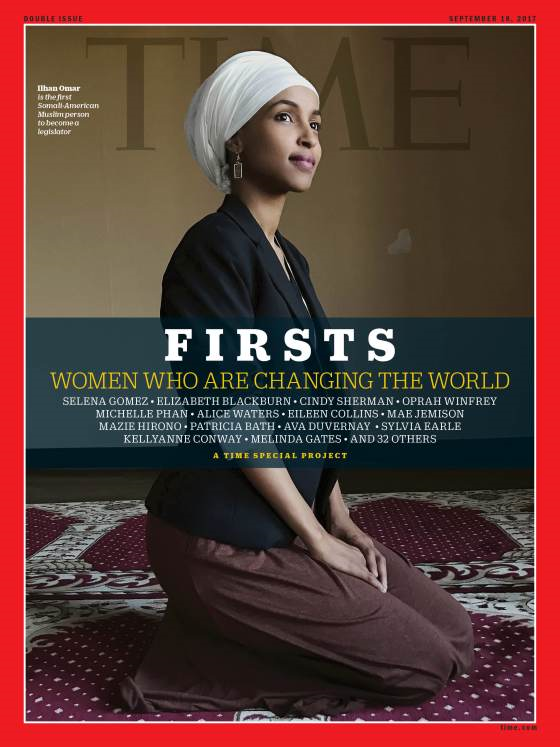 Just this week, Time magazine published a series of covers and profiles entitled Firsts: Women Who are Changing the World. One of the 46 women chosen is Ilhan Omar, the first Somali-American Muslim woman to become a legislator. Imagine little Muslim girls, more importantly Black Muslim girls, looking at this cover. Maybe some will see a career in politics as possible. Or maybe they just see being on a magazine cover as possible. Or maybe they will see a Muslim woman on a cover of a magazine and think nothing at all, because it is becoming the norm. I, for one, am excited at the possibility. I don’t love the concepts of ‘firsts’ or ‘smashing stereotypes’ because the stereotypes and limitations it takes to be “the first” are often imposed on Muslim women by the same institutions that have oppressed them and are now congratulating themselves for “valuing” them. But some Muslim women have resisted those discourses. In her interview with Time, for instance, Ilhan talks about “shifting the narrative.” I like that idea so much better. It acknowledges that there is a narrative already in place that doesn’t include everyone and needs shifting. We need to modify the narrative for those possibilities to exist. An important thing to acknowledge is that a good part of these shifts in narrative are being put forward by Black Muslim women, despite rampant anti-Blackness in Muslim communities, including in my own Palestinian community. Thus, as non-Black Muslim women we need to acknowledge and support the narratives led by Black Muslim women. We also need to also appreciate all of our Muslim sisters not only for what they accomplish and how that “contributes” to Muslim communities, but for who they are themselves. The world may be literally on fire and underwater but there is hope on the horizon. There are examples of good things happening every day. It’s ok to celebrate the wins and more positive representation of Muslim women is always a win! Thank you Fatin marini. A needed article that highlights beauty in our times. Well done!